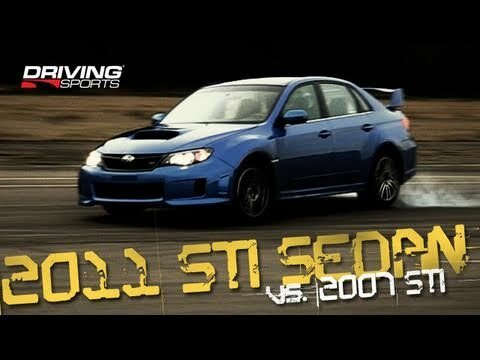 For 2011 Subaru brings back the STI as a 4-door and a long list of improvements. How does this new model compare against the now “classic” 2007 design? Owners claim that the 2007 STI was the “best” ever and the changes made to the model in subsequent model years softened the car and ruined its driving performance. 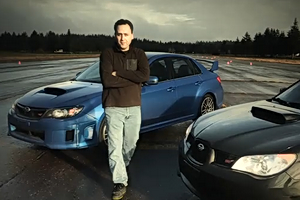 Does the new 2011 STI model live up to its expectations? Apologies in advance from Driving Sports TV for borrowing a certain format from another popular automotive show. All 2007 Impreza WRX STI models are powered by a turbocharged and intercooled 2.5-liter DOHC Boxer engine producing 293 horsepower at 6,000 rpm and 290 lb-ft of peak torque at 4,400 rpm. The Subaru Active Valve Control System (AVCS) variable valve timing technology helps provide strong torque characteristics throughout the engine’s operating range. A manually operated water spray feature helps to bolster intercooler efficiency during spirited driving. The 2011 STI models continue with Subaru’s familiar 2.5-liter turbocharged flat four, 6-speed manual transmission, and standard all-wheel drive. Power is unchanged from the previous year — the STI produces 305 hp at 6000 rpm and 290 lb-ft of torque at 4000 rpm.